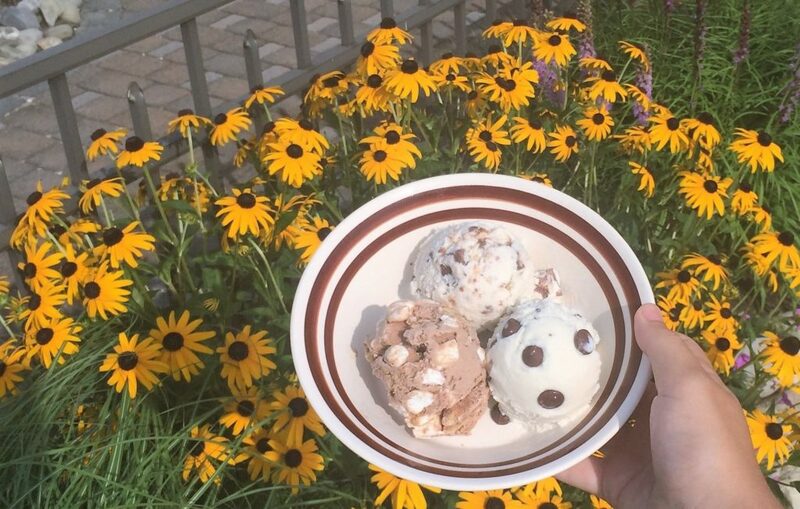 The best summer bod is a body with ice cream in it. Ice cream is a summer essential and somehow things just taste better when you make them yourself. You can also use the base recipe and make it your own. Let’s get creative, y’all. You do need an ice cream maker for these (for reference: the one I’m using is a three-piece Cuisinart machine), but for some no-churn ice cream recipes, check out this article. Put the Kit Kats and churning bowl into the freezer to cool. Put the sugar, cream, and vanilla extract in a pot. #SpoonTip: I usually use light cream to be “health conscious,” but the higher the fat content in the cream, the thicker and smoother the finished product. Heat over a medium flame, stirring occasionally. Once it feels smooth to stir (and you’ve done a taste test to see if you need to add any more vanilla), pour the mixture into a container, seal it, then put it into the fridge to chill. This usually takes around 3 hours. Take the container out of the fridge once chilled through and pour it into the churning bowl. Quickly put the paddle and cover in place then turn on the machine. Take the candy from the freezer and smash it into smaller pieces and put them into the ice cream container. Pour the ice cream on top of the candy once it’s fully churned, about 30 to 40 minutes. Mix the candy in so it is distributed throughout. Freeze all the way through (4 hours minimum), and enjoy. Put mini marshmallows and graham crackers into the freezer, along with the churning bowl. Put sugar, cream, and vanilla in a pot. Once warm, add a heaping tablespoon of cocoa powder and mix. It will be clumpy at first, but as it heats, the cocoa will melt and blend. Feel free to taste and add more cocoa powder if needed. Once the base looks and tastes like hot chocolate, take it off the stove, pour it into a container, seal it, and then put it into the fridge. There may still be some clumps, which you can get rid of by straining the mixture as you pour it into the container if you prefer. Take the container out of the fridge and pour it into the churning bowl, place in the paddle and cover then turn on the machine. Take the crackers from the freezer and break them into small to medium size pieces, then put the pieces into the ice cream container with the marshmallows. Pour the ice cream on top of the add-ins once it is fully churned (about 30 to 40 minutes later). Mix it so the graham crackers and marshmallows are distributed throughout. Freeze completely (4 hours minimum) and enjoy. Put churning bowl into the freezer. Pick or buy fresh mint. Usually around 25 large leaves or two handfuls is enough. Make sure you rinse it off before you cook with it. #SpoonTip: If you’re using mint extract instead, a little goes a long way. Add it little by little, tasting the mixture every time. Finely chop the mint, either with a knife or in a blender. This helps to release the oils in the leaves, so you can get all the flavor out of them. Put the mint in a pot with the sugar, cream, and vanilla. Once it feels smooth to stir, pour the mixture into a container, seal it, then put it into the fridge to chill. This usually takes around 3 hours. Place a strainer on top of the churning bowl and pour mixture through it to get out the chopped mint leaves, which you can discard. Put on the paddle and cover and turn on the machine. Pour the ice cream into the container once fully churned, about 30 to 40 minutes later and mix in chocolate chips. And don’t forget, the best part is always licking the spoon.